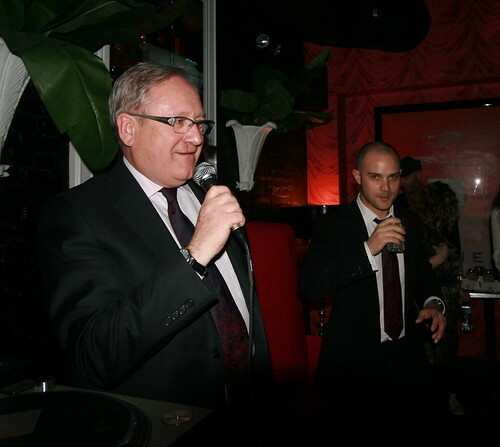 The other night, co-author Tony Hightower and I were invited to the launch party that Pernod Ricard was throwing to introduce Beefeater 24, its newest offering. (Here's the press release.) 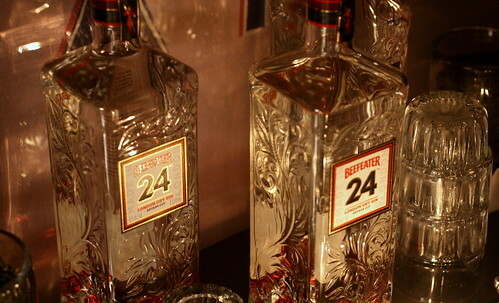 A premium gin, Beefeater 24 has some unusual botanicals, chiefly its use of Chinese green tea and Japanese Sencha tea. There are also a lot of citrus notes; the other botanicals in the gin are grapefruit, Seville orange (much like regular Beefeater), lemon peel, licorice, almond, orris root, angelica root, coriander, and of course good old juniper. We spoke with master distiller Desmond Payne, and he told us about the process of creating an entirely new gin: "It was about five years ago, in Japan, and I was drinking my favorite gin and tonic, but there was something different. They don't allow quinine in tonic water there, so I started using iced teas as a mixer." He went on to tell us that the lemon-flavored iced teas brought something new to the gin, and it got him thinking. After about eighteen months of tinkering in his lab (with a miniature still and gin production line -- and wouldn't that be fun to play with! ), he came up with what would become Beefeater 24. The company "slightly bravely" convened tasting panels in New York and London, and solicited feedback from illustrious cocktailians such as Sasha Petraske, Audrey Saunders, and Gary Regan. The panels told him that it was missing a little something, and after some extra research Payne came up with Japanese Sencha green tea. It's named "24", Payne told us, because the botanicals steep in the neutral spirit for 24 hours before distilling. He said that scaling the gin up from his tabletop still also presented challenges, and that "exactly the same as the skill of making a good cocktail, you've got to keep it all in balance", likening it to spinning plates. Payne also told us that it was a great pleasure to make his very own gin, noting that "all these years, I'd been making someone else's recipe." He's been in the gin-making business for over forty years, including time spent at Plymouth and Beefeater...so originality hasn't always been prized by his bosses as much as utter consistency: "In my office at Beefeater, there's a portrait of our founder James Burroughs on the opposite wall. staring down at me. And if ever I'm tempted to put in so much as an extra juniper berry, there's going to be thunderbolts." 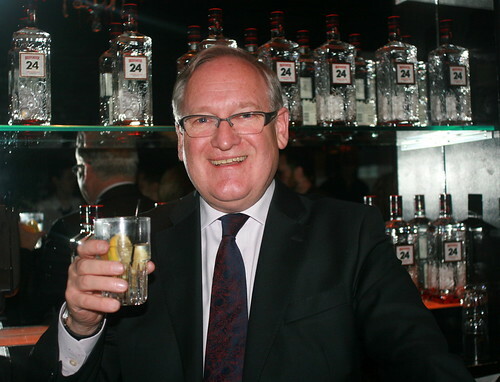 Both Desmond Payne and Beefeater brand ambassador Dan Warner told me something I hadn't heard before and thought was interesting: Spain is the single largest per-capita consumer of gin -- more than the UK even. (The US buys more Beefeater by volume than anywhere else, however.) And it's not just sozzled British expats on the Costa del Sol drinking up all that gin; much like vodka is the trendy spirit in the US, gin is greatly favored in Spain. I look forward to mixing with Beefeater 24; I think the tea's slight astringency might make for an interesting Ramos Gin Fizz, and the Pernod Ricard PR rep described a tea-based drink (reminiscent of Audrey Saunders' Earl Grey Marteani) where you infuse a bag of Earl Grey tea into the gin and then mix with Peychaud's and Dubonnet. I think a Corpse Reviver No. 2 would be pretty good, too, given its Lillet and Cointreau and lemon components. Perhaps something with Aperol or Suze? Or a lightish fizz? This'll be fun. Sounds delicious! Where can i get my hands on some! They're launching it first in NYC and San Francisco, but rolling it out to more markets in the US. I'd think that by the end of the summer, any good liquor store would have it or be able to order it. It is made in London? I read last year that Beefeater's is the only gin factory in London these days, although I do not know if all Beefeater is made there. With multinationals being what they are you never know! Mr. Payne told me that all Beefeater, including the 24, is made at their distillery in Kennington, right by the Oval.